Today’s featured composer/musician is Sister Marie-Seraphine Gotay. 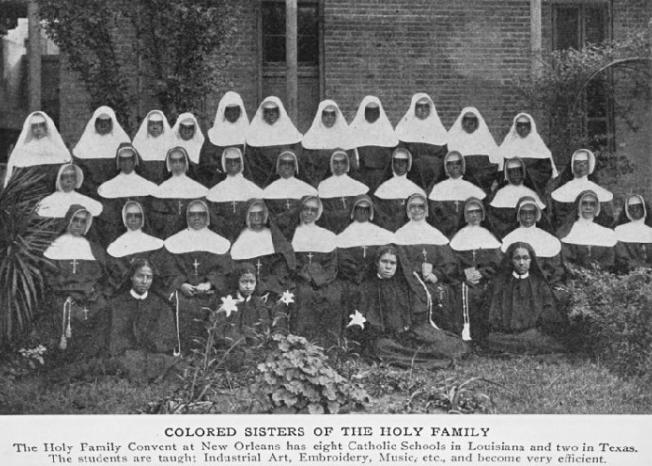 The Sisters of the Holy Family, in about 1905. They were established in 1842, and are now the oldest female-led African-American order in America. Originally from Puerto Rico, Sister Marie-Seraphine Gotay (1865-1932) is the only Black female composer known to be active in New Orleans at the turn of the 20th Century. Against the odds, she attended a Roman Catholic music school not normally open to non-Whites, where she learned to play multiple instruments. She eventually became a music teacher for the all-Black Sisters of the Holy Family, staying in her post as director of music education for nearly fifty years. Her music was lost when the order’s convent moved from the French Quarter in the 1960s. We were able to locate her only extant work, “La Puertoriqueña: Reverie” and plan on including it in our volumes!